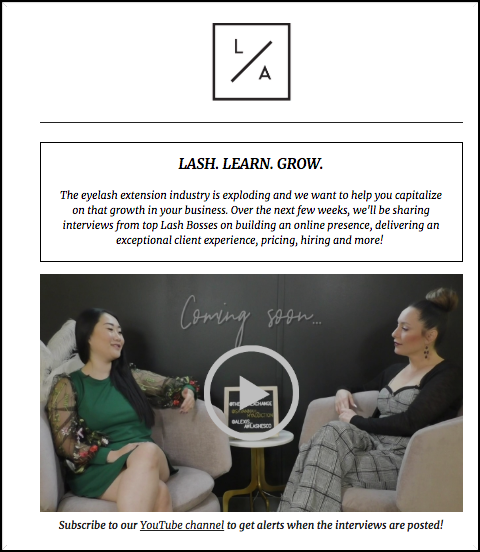 If you want to use online media to grow your lash business, email is one of the most widely used and effective forms in which to do so. Nearly 90 percent of today's internet users send at least one email a month, and in 2019, the share of monthly emailers is expected to continue to grow. Business owners confirm email's effectiveness, with 80 percent of retail professionals saying email is the greatest drive of customer retention, according to eMarketer. You can share valuable information with your customers, which builds your credibility and expertise. Email newsletters increase brand recognition, and email subscribers are three times more likely to share content on social media compared to leads from other channels. You can promote deals, services, referral programs, and loyalty programs through email. 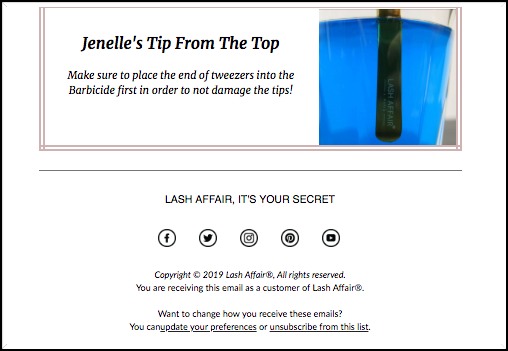 Here are some best practices for creating an effective email newsletter program for your lash artist business. There are many free email marketing platforms you can join. Many offer free services as long as you're only sending a certain number of emails to a certain number of clients. For example, MailChimp is a great resource for small businesses looking to grow their email subscriber list and offers a free plan for up to 2,000 subscribers and 12,000 emails per month. Only add email addresses given to you by your customers. Stealing emails and adding them to your list without user permission will result in your emails being marked as spam, which can get you banned from sending emails by whatever service you use. You'll want to send regular emails to keep customers engaged, but not overload users who might unsubscribe when you message them too often. A good best practice is to ask your customers how frequently they'd like to hear from you when you collect their email address. For example, you can give customers a choice between monthly, twice a month or weekly. Then you can segment those users into lists based on frequency. From there, create an email calendar that lists themes of your emails, so you ensure you'll vary the messaging to keep users engaged. Most free services like MailChimp have easy-to-fill-out free email templates. You simply input your messaging and images, and you have a beautifully designed email, created by you. You don't want to send the exact same message to every client. For example, you wouldn't send a welcome email to a client you've had for years, and you wouldn't send an anniversary offer to someone who just visited you for the first time. This is where segmentation comes in. Email clickthrough rates increase by more than 100 percent when subscribers are segmented into custom groups. Email segmentation means you can also automate your email messaging, which saves you time from having to manually message users. For example, if someone subscribes to your email newsletter on your website, whatever email service you use can automatically send a welcome email to that user. The message is relevant, which engages the user. 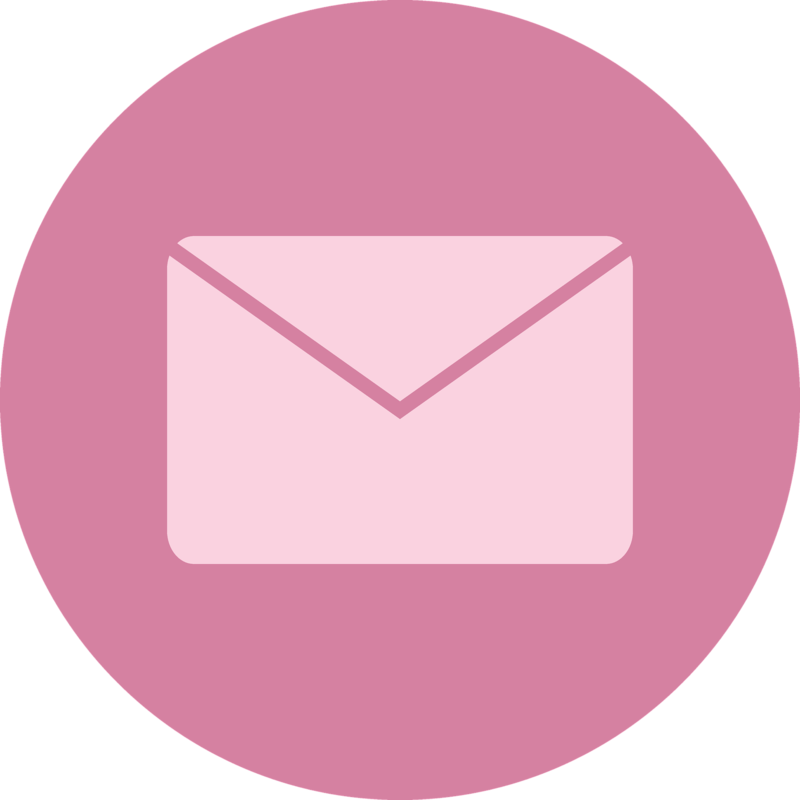 Answer client questions - Use email to educate your clients based on commonly asked questions you receive during appointments, on social media, and on review sites. Promote your blogs - Share teasers from your latest blogs posts in an email newsletter, and link to the full posts. 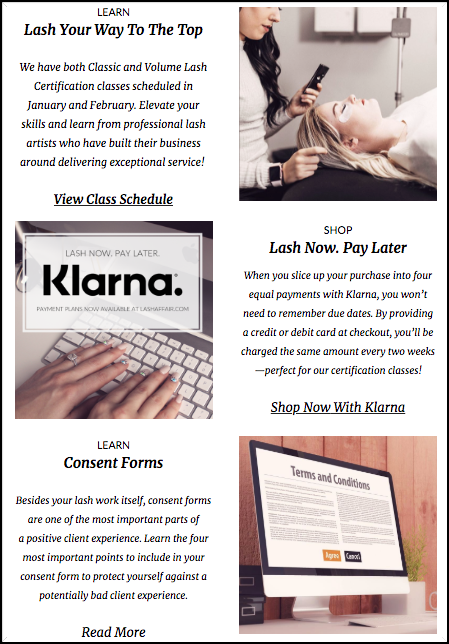 Give custom offers - From a birthday deal to a product promotion that relates to lash care, show off offers, services, and products that relate to your clients' latest services. While the email content should relate to that individual customer, you want to make the content valuable and engaging enough that the client will want to take an action — whether that's booking an appointment with you or forwarding that helpful information to a friend. Visuals like photos, graphics, and videos make your emails more likely to be consumed. According to HubSpot, visuals increase a client's willingness to read your content by 80 percent. Being in the lash artistry business, there are tons of great photo and video options to include. You can use YouTube video links to demonstrate lash techniques, or include a photo of your latest lash transformation. There are also sites like Pexels that have thousands of free photos you can use, that don't require photo credits. You can use a free graphic design site like Canva to build your own eye-catching graphics. Photos, graphics, and videos keep user attention and will help increase the likelihood that your other email messaging will be consumed. In every email newsletter, make it easy for the client to take further action with your business by including your full contact information, too.